This rendition of the classic rice pudding dessert truly highlight the humble grain of rice. It’s a rice on rice concept, one that makes the most out of one ingredient. The rice is cooked in horchata- a Latin American drink made from water soaked in rice, almonds, cinnamon, vanilla, and sugar. This flavor is highlighted by first toasting the rice in the horchata and in the rice pudding itself. The dish is served with candied almonds, to bring out the almond flavor in the horachata, to match the toasted flavor in the rice, to add a necessary crunch to the mushy pudding. 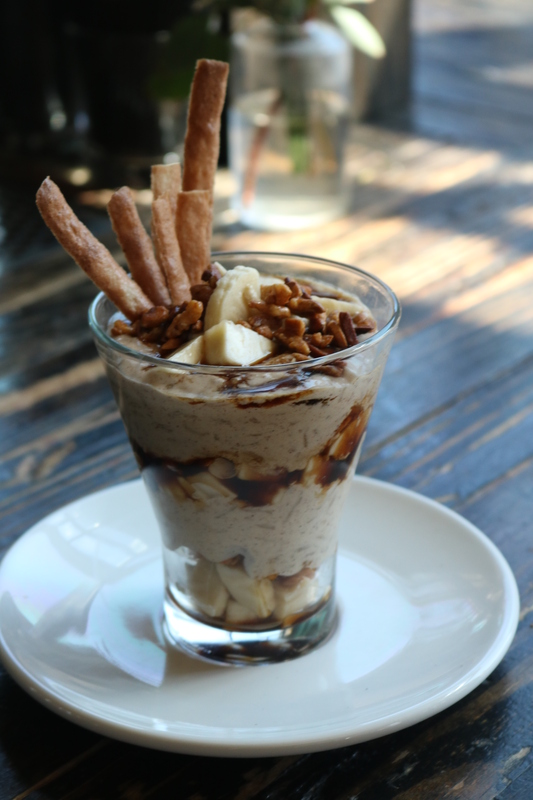 The horchata rice pudding, rice on rice custard, is also served with diced raw banana and a caramel sauce made from Guanabara beer- A Brazilian Imperial stout made with raw cane sugar. The caramel sauce is additionally sweetened with raw cane sugar- in this instance piloncillo, a Mexican version that is readily available. The banana and beer go great together, each drawing out the flavors of one another. The grain of the beer pairs well with the toasted rice, unifying all the flavors. To further draw out the raw sugar flavors present in the beer, and the natural sweetness of the banana, the horchata rice pudding is sweetened with demerara sugar- it’s like sugar in the raw but just slightly less processed, having a nice raw flavor to it. The only processed white sugar in the dish is presented in the candied almonds- here it is necessary because the almonds are caramelized slightly, and this can only be done with a purified sugar else it will burn. This dish is finished off with long, thin crisps made from almond meal, banana purée, and rice flour to add height and another crunch dimension. This dish is presented in layers in a parfait style to give class to this common food item, to showcase the subtle flavors that all tie together nicely to highlight the simple grain of rice.